Campus Suites, one of the leading student housing development and management companies in the U.S. and Canada, was building a new, 900-bed student housing community at Arizona State University. The client needed to create a buzz around the development in order to pre-lease the community before its inaugural year. 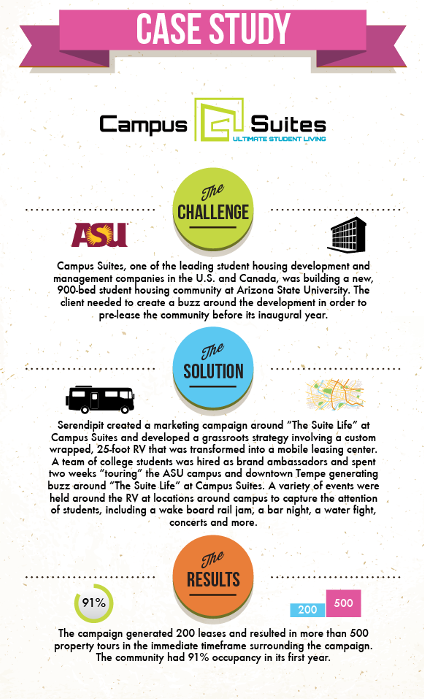 Serendipit created a marketing campaign around "The Suite Life" at Campus Suites and developed a grassroots strategy involving a custom wrapped, 25-foot RV that was transformed into a mobile leasing center. A team of college students was hired as brand ambassadors and spent two weeks "touring" the ASU campus and downtown Tempe generating buzz around "The Suite Life" at Campus Suites. A variety of events were held around the RV at locations around campus to capture the attention of students, including a wake board rail jam, a bar night, a water fight, concerts and more. The campaign generated 200 leases and resulted in more than 500 property tours in the immediate time frame surrounding the campaign. The community had 91% occupancy in its first year.